Here is the ridiculously cold January 1868 at Albany. This was one of the coldest months in PNW history, right up there with January 1862, and also featured one of the greatest cold waves on record. This month appears to have averaged between 22-25 degrees in most lowland areas of the I-5 corridor. Eugene fell to -15 during this month (on the 10th), and there was 3-4 feet of snow in Hillsboro according to one source I've seen. NOTE: The following max/min data is derived from 3-observation daily logs (7 am, 2 pm, 9 pm), so the real high and low temperatures are not known. There could be a significant difference between the real 24 hour max/min data and the 3-observation-derived data that is shown, so keep that in mind. But to get a general idea of where things were, this obviously does the trick! -At least 18.5" snow, plus the one missing day that had either heavy snow or freezing rain, or both. -Minimum of -6 observed at 7 am on the 11th, but the real minimum may have easily been -10 or lower between the observation times. Recall that Eugene bottomed out at -15 in this event, on the 10th. Yeah, that winter was basically 1861-62 lite for sustained cold. It started at the end of December and lasted well into February. Much drier though with the cold for the most part. I don't think the 3-4' report at Hillsboro is quite accurate, although The Oregonian did report a few inches near there on the ground in mid January while Portland still had bare ground. There were also a number of 2-4" type snowfalls that winter in the Portland area amidst all that cold, but nothing major. Oh interesting. Who knows. Either someone fibbed or it was a report from further west with some elevation. Record warmth in western N. America. Port Orford hit 79 degrees on 1-25-2014, just missing the state record high for Oregon for January (80 in Brookings on 1-28-1984). Bandon tied its monthly record of 75 degrees. In Alaska, upper 50's surged into the Anchorage Bowl. Palmer hit 57 degrees, smashing its monthly record of 52 from 1961, and Palmer Airport hit 58. In the interior, Big Delta hit 50 degrees - not a monthly record, but remarkably the 4th time in 7 years that Big Delta hit 50 in January (2008, 2009, 2011 and 2014, monthly record of 54 set in 2009). Since records began in 1942, Big Delta had never exceeded 48 degrees in January until 2008. Truly phenomenal warmth overspread NW Canada. Fort Nelson, BC soared to 59 degrees (14.9c), shattering its monthly record of 51 (10.7c) from 1-19-1981. Another station in Fort Nelson hit 60 degrees (15.3c). In the Yukon, both stations in Burwash - town and airport - reached an unfathomable 62 degrees (both at 16.5c). These are the highest January readings in Yukon history as far as I'm aware. For the Burwash town station, the previous January record had been just 49 degrees (in 2009). However, a similar freakish surge of warmth hit Alaska/Yukon right before Christmas in 1999, providing some historical context to January 2014 more than the previous January record could provide. Burwash hit 56 degrees (13.5c) on 12-22-1999, the previous highest reading in the entire Nov-Mar period. As an aside, numerous monthly records had fallen in Alaska during the December 1999 event, with readings well into the 50's in the interior. Dry Creek hit 60 on 12-22-1999 in what may have been the warmest reading in interior AK history during the heart of winter. Back to January 2014, Fort Liard hit 61 degrees (16.0c), representing what was likely the highest January reading on record for the Northwest Territories. As with Burwash, the previous January record was significantly lower at 49 degrees (in 1985). Another station in the downslope zone of western NT, up against the topography near the Yukon border, recorded an even higher reading - Wrigley hit 63 degrees (17.0c), but I'm not sure how reliable this particular reading is. It may very well have been accurate. All the way up at 70N latitude, Cape Parry hit 39 degrees (4.0c). This station has records from 1957-2002, and the previous January record was just 30 degrees in 1981. On the one year anniversary of the previously described record heat, Eugene soared to 68 degrees on 1-24-2015. This broke the January airport record of 67 (in 1975 and 2005), and just missed the city record of 69 from two torch-tastic Nino's (1914 and 1931). A couple days later, Newport hit 72 degrees, the probable January record for the city. This reading was recorded at the new COOP located 3 miles north of town. The previous long-standing COOP (which stopped recording in 2010) had never exceeded 69 in January. Government Camp hit a ridiculous 70 degrees, shattering the monthly record of 63 from 1994, 2013, and 2014. It was the 3rd straight January with a monthly record high at G Camp. The 70 degree reading also exceeded the previously untouchable mid-winter record of 69 from 2-1-1962. Not to be outdone, Santiam Junction hit an other-worldly 72 degrees on 1-26-2015. Temperature records at Santiam Junction only date to 1986, but the previous January record was just 62 degrees - set in 2014. The warm air spread east of the Cascades, and monthly records of 71 degrees were set in both Bend and Condon. At both locations, the previous January records had been 67 degrees (Condon in 1939, Bend in 1971). Wow that is some serious winter time torching! Two cold snaps hit the Rocky Mountains on January 31-February 1 in both 1951 and 1985. Here are some records and temperatures. There weren't as many records set as during the cold snap of February 1989 or December 1990, but some of the ones that were set were quite impressive. -65 at Peters Sink Utah. I believe this was the forth coldest reading recorded in the Lower 48. -51 at Sage Creek Ranch Utah. This is probably the coldest temperature recorded in Utah that was recorded in a place where someone lives. Apparently it isn't official, though very plausible given the location (Sage 4 NNW Wyoming a few miles away also hit -51 the next day). -69 at Peters Sink. This was the 2nd coldest reading in the Lower 48. -51 at Sage 4NNW Wyoming. -38 at Idaho Falls Airport. -61 at Maybell Colorado (which happens to be just west of where I live). This was the coldest official reading ever recorded in Colorado. I believe that it was also the coldest temperature in the world ever recorded that close to the equator. -60 at Taylor Park Colorado. Ties for the 2nd coldest temperature in Colorado. The other two times where -60 was recorded were 1/1/1979 at Maybell and at Taylor Park, also interestingly also on 2/1/1951. Taylor Park is in the southern part of Colorado and I believe that this was the coldest temperature in the world ever recorded this close to the equator. -41 at Fort Collins Colorado. I thought that this was the coldest temperature ever recorded in the Eastern Plains of Colorado, but it appears that Greeley hit -45 on 2/12/1899. -27 at Colorado Springs Airport. -60 at Taylor Park Colorado. Right now in 1989 I was looking out the window a lot. 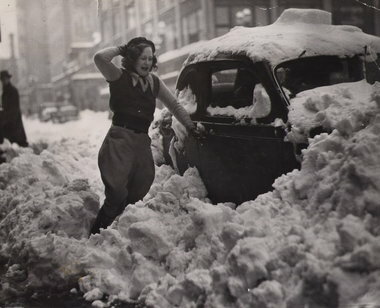 On this day back in 1937, Portland ended up with 16.8 inches of snow from a monster snowstorm that started on January 31 and ended on February 1. Huge snow drifts blocked roads in northern Oregon and the Cascades mountains passes. Here is a picture of the aftermath the next day in downtown Portland at SW Broadway and Alder Street. Right now in 1989 there was a huge graupel shower which triggered a flash freeze with strong northwesterly winds. That pattern actually was triggered by a #SSW. One of the most prolific SSWings ever recorded, actually. Perhaps it doesn't quality as a major event, but my house was -48 on 2/2/2011. This is the coldest I have been out in, so I guess it is a "major weather event" for me. Oklahoma also set their state record then, but I don't know if that qualifies as the West. Salem had 25” in 24 hours. Awesome, I didn't know they got that much. Feb 6 and 7 of 2014. An amazing storm and one I will never forget. I was on the coast at the time as Tillamook and Pacific City racked up 6" on both days. Was absolutely incredible and watching the models converge on it was truly remarkable. They weren't even hinting at a snowstorm 3 days out as most of us in the NW just expected a dry cold, but ho boy was that one something else. Exciting northerly flow in the valley, and mesmerizing easterly flow at the coast. The thread seems to have died, but February 5-7 1989 was one of the most severe modern cold snaps to hit the Western US. There are too many to list, but here are some that are applicable to where I lived at the time or live now. Salt Lake City (where I lived at the time) hit -14, which is the coldest temperature recorded there within my lifetime. The coldest temperature in a town in Utah during the cold snap was -47 at Roosevelt. Craig Colorado (where I live now) hit -51 at the official weather station. Some employees at CDOT went down to the Yampa River Bridge on that day and recorded a probably accurate, but obviously non-official -65. There were other impressive records set in all the Western States. Hopefully others can post some too. Salt Lake City (where I lived at the time) hit -14, which is the coldest temperature recorded there within my lifetime. The coldest temperature in a town during the cold snap was -47 at Roosevelt. Coldest February day on record at DEN on 2/4/89, with -9/-16. The next morning fell to -24. The -9 is tied with 1/11/63 as the coldest high in Denver history. February 7 and 8, 2017 was the peak of the snow depth here last winter. February 2017 had a monthly total of a little more than 32” here. Pretty awesome. February had slightly more snow than January and March here last winter to make it the snowiest month. Most of it fell the last week of the month down here. There are a number of big events that I didn't get around to posting. It's pretty amazing how many really good ones there have been in the past. February 9-10 1933: A historic cold snap for the West. There are too many records to list, but here are some of the more impressive ones. February 10 2017: A historic heat wave for the Rocky Mountains (and probably other areas as well). February 6-7 2015: A historic heat wave for the Rocky Mountains (and probably other areas as well). 61 at Craig Colorado Airport on 2/9/2015. The previous January record was 55 and the next earliest warmest temperature was 62 on 3/8/1986. This is the last day of a 3 day snow event in 1985 that dropped 16.5" of snow at Silver Falls. The record lows the 3-9th are all from 1989, save the 6th which was 8 set in 1948. I missed this yesterday but feb 8-9th 2017 was the worst ice storm I’ve seen here. We don’t often get much freezing rain here. We generally transition from snow straight to rain. I saw him at Sharper Image in Pioneer Square back in the late 1990's. Seems to me he went off the air right as our winters started going to hell. Pretty good chance they're related. We were lucky last night only because the NWS hastily dropped WWA around 4:00 p.m. The snow threat was inevitably over. Very impressive Arctic outbreak here from 2/18-2/19, 2006. DEN saw two straight days with single digit highs, including a 7/-13 day. Only the 1962 event was colder later in the season. I've grown to appreciate Feb. 2006 over the years. Sub-zero dewpoints at PDX with E winds 43g51 at one point. The 37/25 spread that day didn't do that CAA justice. Yeah, not many examples of subfreezing daytime highs that late with wall to wall sunshine. That airmass had some teeth, just had the misfortune of being an early morning (and totally dry) arctic front. It was literally the most impressive outflow day I saw my entire time in Tacoma. Gusts to 60 mph that day from the east, with afternoon temps around 30. February 19, 1993 was a pretty special event. Really stands out among childhood memories. That was a great winter and that event book ended it nicely. On this day in 1948, Denver saw its latest -10 on record. Attached is an image from the book "All Over Oregon and Washington: Observations on the Country" published in San Francisco in 1872, by Frances Fuller Victor. 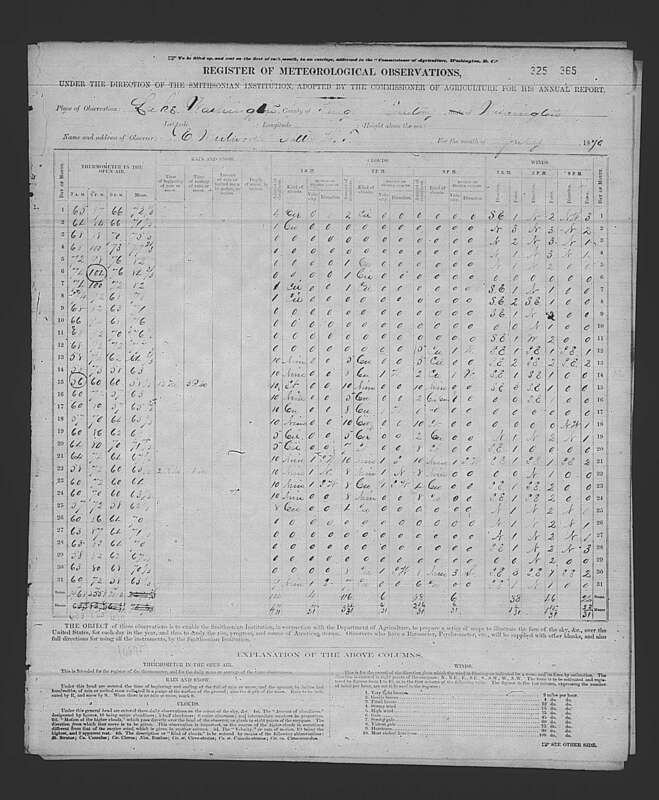 Nice record of Portland weather in 1870. Note the 9.5" of snow in March and a low of 18, I presume that this occurred with the major mid-month airmass. Also the 102 degrees in July sticks out. Most likely from the major heat wave that happened in the first week of July and also supposedly brought 100 degree readings to Seattle. Most likely from the major heat wave that happened in the first week of July and also supposedly brought 100 degree readings to Seattle. Supposedly Seattle was 102 to 104 on 7/6/1870. Remarkably dry Jul-Oct if that is to be believed. Only 5 rainy days for all of Sep and Oct? The precip records definitely look a little suspect, with the exact same amounts Feb-Apr, May-June, and then Jul-Aug. I remember that article. KOMO gave way too much credence to suspect old observations, with splashy language like "putting 2009 to shame." It's news people being news people as far as I'm concerned. There's very little chance those 1870 readings are accurate, considering the rampant over-exposure of thermometers back in those days. They were definitely more cavalier with the observations, back in the day. Yes, it was probably over exposed. There was definitely a heat wave then, but it's hard to collaborate just how hot it got because there weren't many stations to compare to. If Portland was "only" 102, Seattle was probably in the upper 90's. Some additions to January 2014 in Alaska - the state monthly record high for January was actually tied with a reading of 62 at Port Alsworth (the 1SW station, main COOP hit 58) and Seward Airport hit 61. These readings are absent from the state climo report for the month, which I had checked before making that post. The Port Alsworth reading tied the state record high of 62 set at Petersburg in January 1981. It would be interesting to see this thread continue through the calendar year. We always hear a lot about winter events but not too much about big events in other seasons. Except for summer heat waves to a lesser degree. March 20, 2002. We were nearing the end of an epically snowy stretch for so late in the season. It was snowing heavily that morning with temps in the mid 20’s. 6” of fresh snow overnight and close to 10” on the ground. The snow stopped mid morning but it remained cloudy and Shawnigan Lake officially recorded a 32/27 day. 23” of snow fell here in March 2002. March 17-20, 2003 marked the second biggest snowstorm in Denver history. 31.8" officially fell at the old Stapleton airport. Most of the metro area got 2-3', and some foothills communities got over 6'. The 85 in Centralia on 3/19/1928 is likely the highest March temperature ever recorded in Western WA, at the very least it is the earliest in the season. There was also a reading of 85 at Packwood on 3/21/1960, and 85 at Castle Rock on 3/28/1930. The (probable) WA state record for March is 87 set at Kennewick on 3/30/1911, and also at Hanford on 3/24/1939. Dynamic, continental-style pattern progression. Early season heat wave centered on the 19th-20th, followed by a blast of late season cold centered on the 25th-27th. Clearbrook saw highs reach 76 (early season record) & 74 on the 19th-20th, followed by 41/24 on the 25th and 36/24 on the 26th, along with 4.0" of snow on the 25th (their latest 4" on record). Downtown Seattle dropped from 71 to 43/33. Centralia saw 3 straight days in the 70's, then a 40/34 day less than a week later. Skagit Power Dam, at 510 feet ASL, dropped from 68 to 21 degrees during the week. 15" of snow buried this location in 12 hours on 3/25 (attached screenshot from WA state climo report for March 1914). At Antoine in Okanogan County, highs fell from 60 on the 19th & 20th down to 28 on 3/25, followed by a low of -2 on 3/26. I looked at April snowfall numbers for WA state. So...1899 was a blocky/-NAM winter/spring that also had a consolidated NPAC storm train/subtropical +AAM? What the heck was going on that year? Hard (for me) to make sense of it. Well, from my limited knowledge in this realm...wouldn't +AAM make sense in a +ENSO situation? 1899-00 was an El Nino after all, and MEI bimonthly's had already crept up into positive territory for April/May 1899 (albeit only slightly). A consolidated NPAC storm train in April is also not out of the realm of possibility. April 1991 is another example. Second highest April snowfall at Paradise and it occurred in a developing Nino situation. I dunno, just throwing stuff out there. Yeah, could be. Though 1898/99 was a weak niña according to the JMA reconstruction, so I wonder if there was a major SSW in mid/late January of 1899. Hard to explain how such a monstrous -NAM (and poleward displacement of -AAM from the low latitudes) could have occurred, otherwise.